This gorgeous diamond engagement ring will leave you breathless with its beauty and elegance. 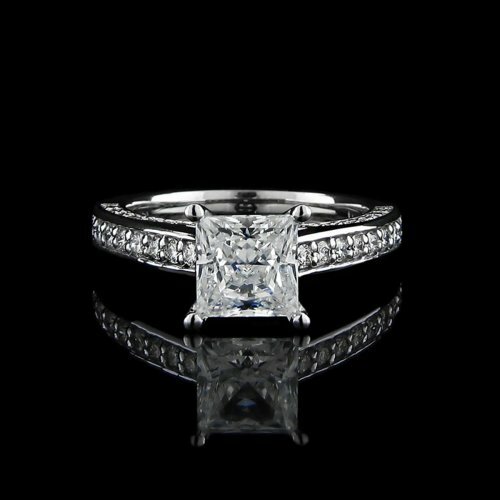 The focal point of this fine design is a glittering, natural enhanced princess cut diamond with a weight of 1.0 carat, SI2 Clarity, G Color. Hugging all four sides of the center diamond are beautiful full cut round diamonds that create a shimmering effect. The side diamonds have a total weight of .64 carat, VS Clarity, F/G color. This gorgeous ring is made of 14kt white gold.